SALESmanago’s Analytical Dashboards is a favorite tool of every CEO, owner or a manager in the company. 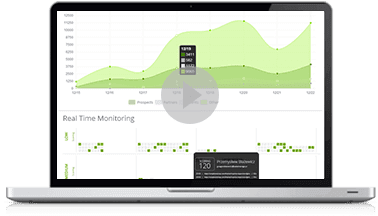 In one place, the Marketing Automation system shows comprehensive analytics of the most important processes of marketing and sales. In the real time module, you can monitor the efficiency of the marketing department at acquiring new contacts (Lead Generation), sales department on activity and results achieved on its own contacts and contacts generated by marketing (Lead Routing) and connected work of both divisions from acquiring contact to closing deals (Campaign Analytics). Additionally, a panel containing basic data on the current base of contacts and its condition is available. 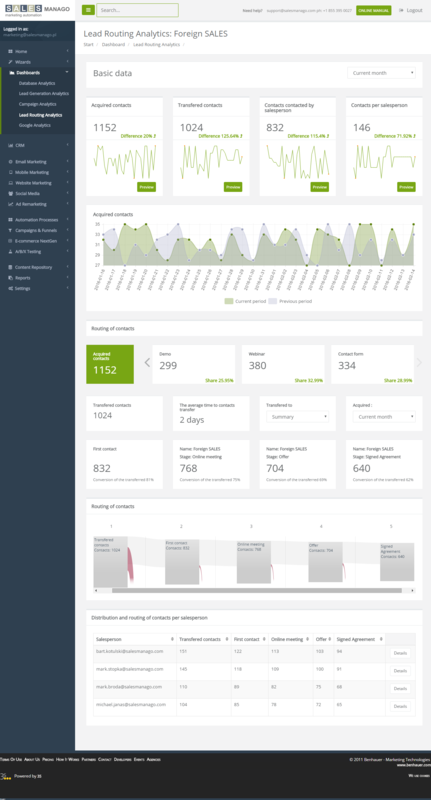 With Marketing Automation platform you have the access to the data that can be generated weekly, monthly, quarterly and annually, making them easy to compare, draw conclusions and to respond to positive and negative trends in a real time module. Basic panel is automatically configured for every client. It shows the basic information about the status and activity of the contact’s database in SALESmanago Marketing Automation system. It allows you to keep track of the basic parameters and to monitor the rate of its change. The information is presented in standard ranges of time: the last seven days or 30 days, the current and previous month, quarter and year. The panel focuses on the primary task of the marketing department, which is gaining new contacts (Lead Generation). 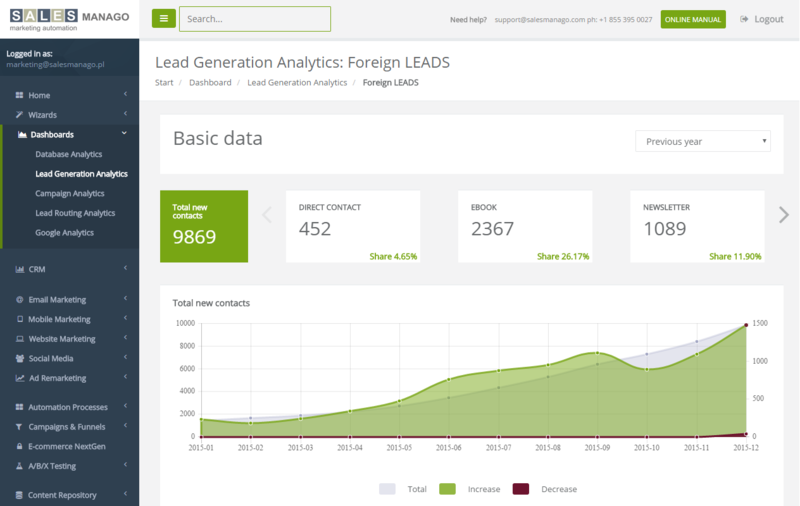 It shows the total number of contacts acquired from the indicated sources as well as per specific source, always in relation to the previous period. 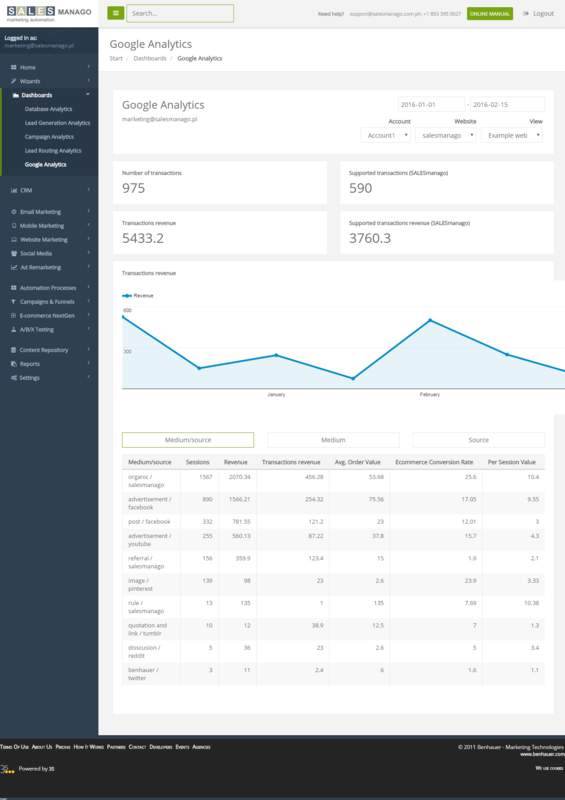 In the Marketing Automation system, the user can configure the appropriate number of dashboards, in order to get a clear picture of the activities. The configuration of this panel is based on the identification of sources of contacts – in the system recognition as different tags. 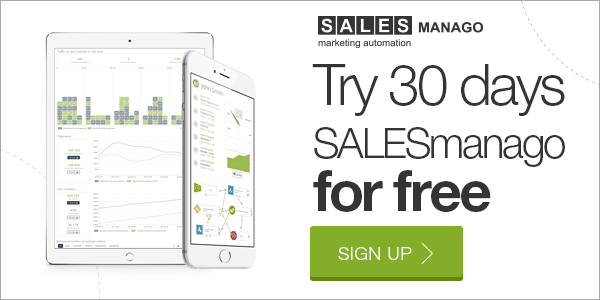 Customizable dashboard, allows you to keep a precise control of marketing and sales campaign within SALESmanago Marketing Automation system. 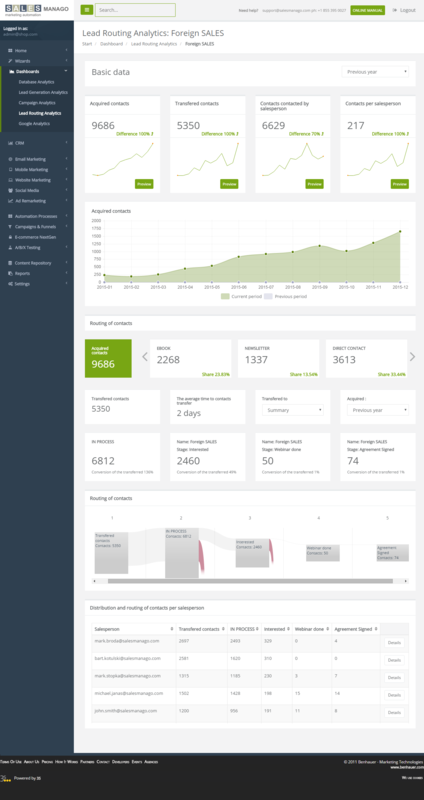 In order to cover all major processes, every user is able to configure the appropriate amount of dashboards. The scope of analysis includes several key stages of the process. 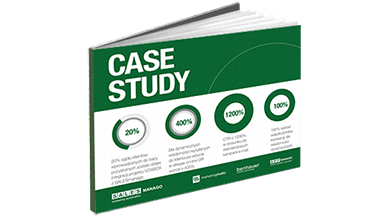 It begins with the acquisition of contacts through their transfer to sales, process sales campaign and ends at the close of the sale. The data is presented collectively for the whole process and above. 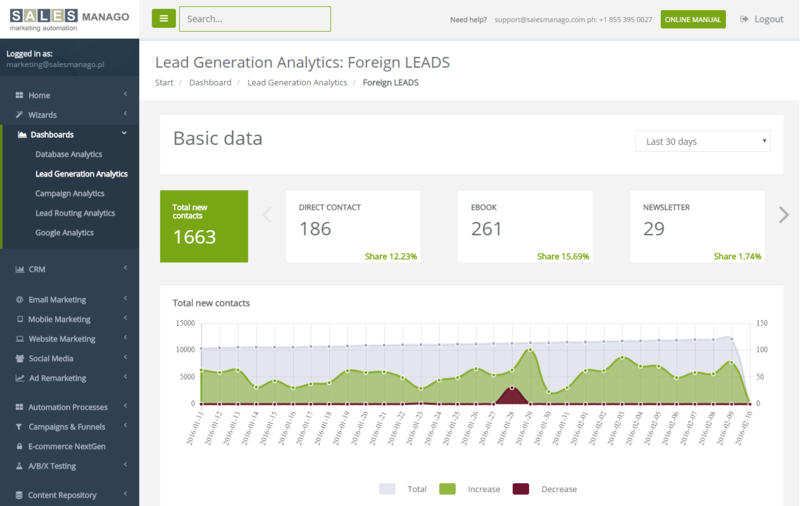 Periods of filtering per trader and/or origin of the contacts is allowed. 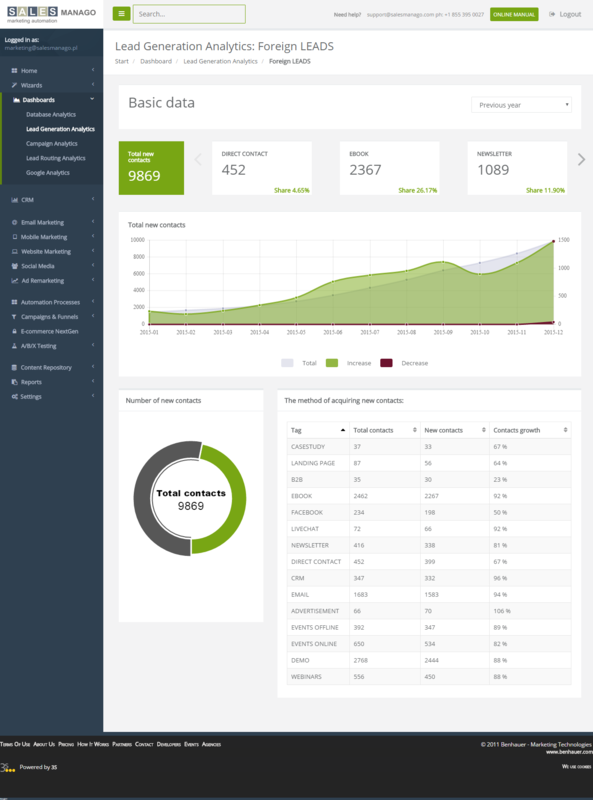 Another dashboard from SALESmanago Marketing Automation system that is easy to customize. 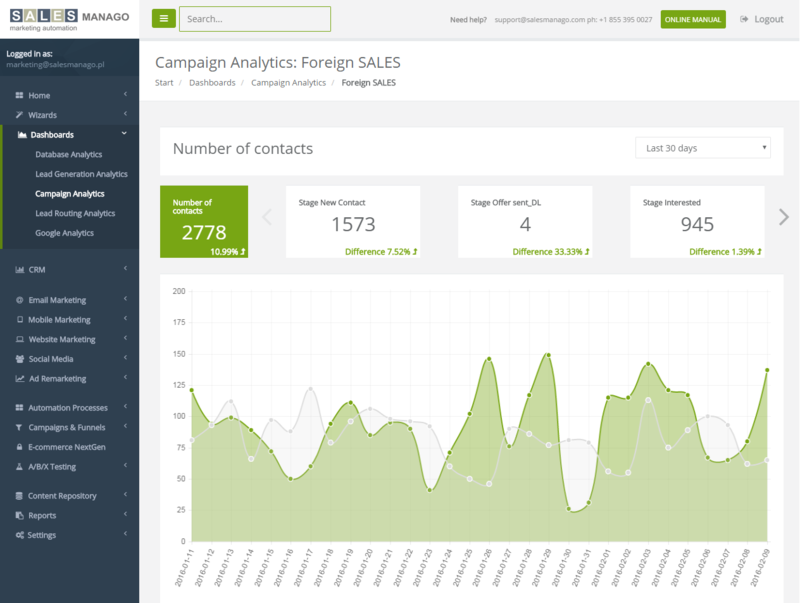 This allows for a very precise control over the campaign of marketing and sales within SALESmanago system. 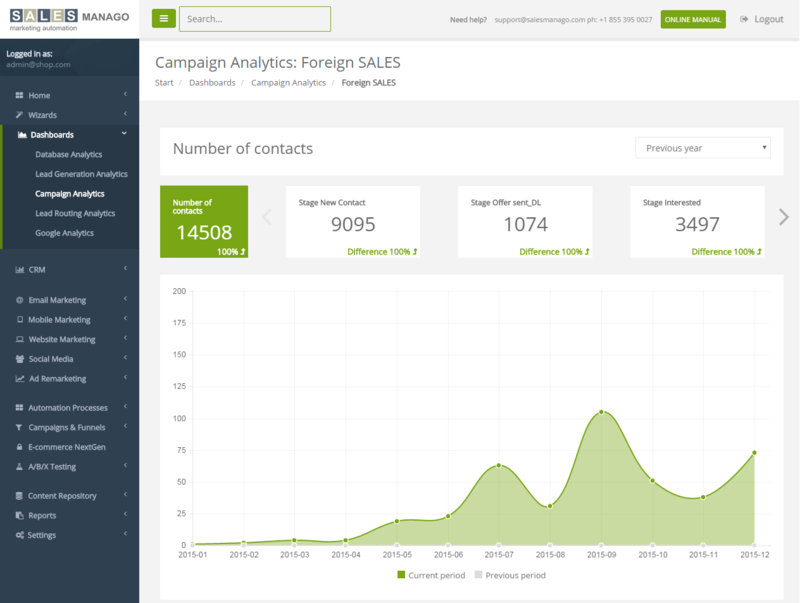 Apart from the quantitative data, SALESmanago shows the impact various marketing communication channels has maintaing contacts and move through successive stages of the campaign. 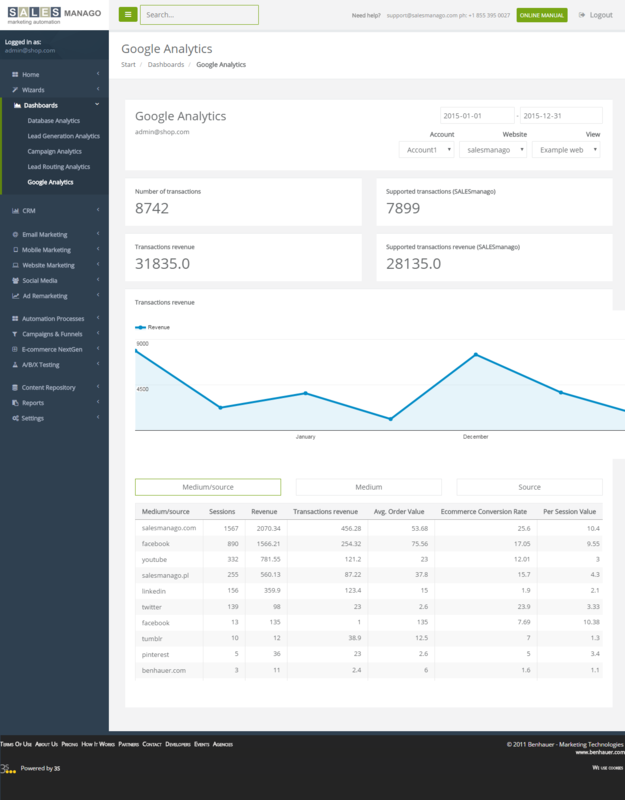 To configure such dashboard you need to define a specific campaign you want to measure and the sources needed to gain customers for. Through integrating SALESmanago with Google Analytics, the system automatically displays the number of transactions generated by the company. 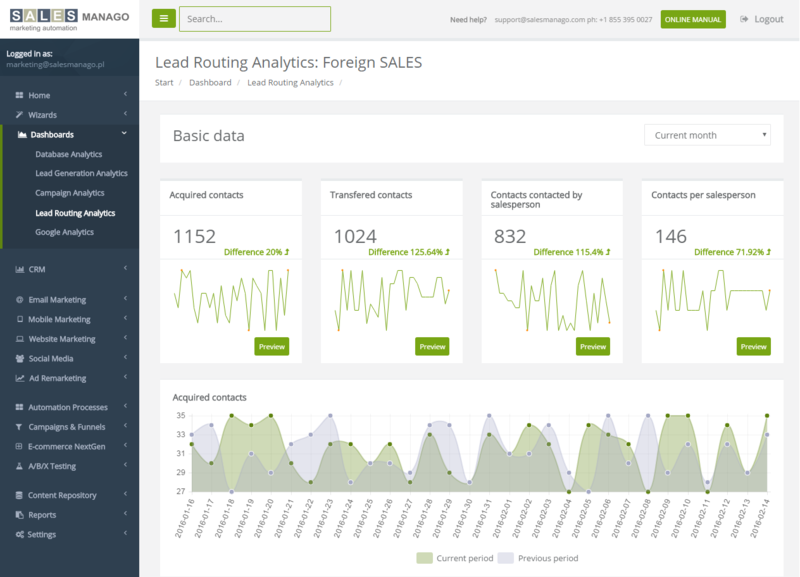 Additionally, it shows transactions backed by actions carried out from the SALESmanago Marketing Automation platform with the exact distribution of the sources and types of campaigns measured by the parameters of UTM.